Actors Alison Brie, Nick Offerman and Megan Mullallly. 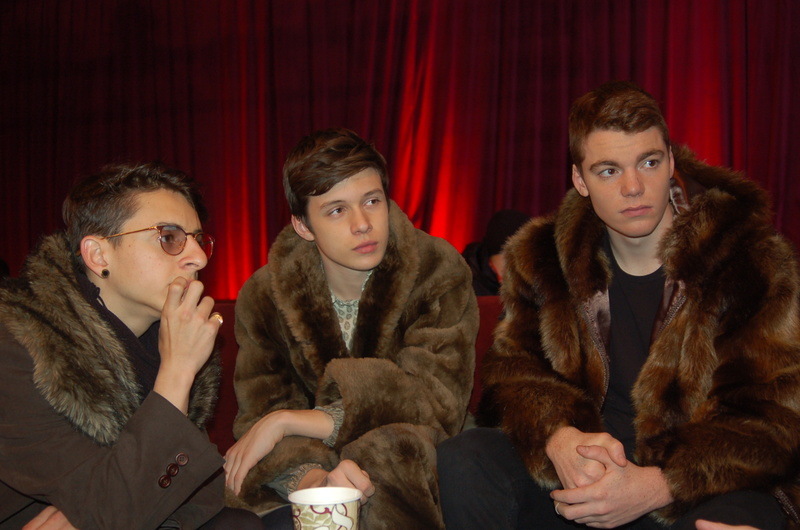 Actors Moises Arias, Nick Robinson and Gabriel Basso. On a chilly Saturday afternoon at this year’s Sundance Film Festival last January, I had just one question for most of the cast and crew of the indie film “The Kings of Summer” that is now in limited release. Did any of them, when they were teenagers, ever really consider running away from home? Of course, all of the lead actors in the film are still teenagers themselves, which made screenwriter Chris Galletta and director Jordan Vogt-Roberts film almost autobiographical for them. “I guess the short answer would be, yes. Who hasn’t?” chimed in actor Moises Arias, who along with actors Nick Robinson and Gabriel Basso decides to flee to the wilderness, planning to build a makeshift house and live off the land as masters of their own destinies. That’s the premise behind this very clever coming-of-age film, which premiered under the title “Toy’s House” at Sundance. Along with actress Erin Moriarty, starring of late in ABC’s “Red Widow” and who plays the romantic interest of two of the boys, all of whom are either 18 or 19 years old, Galletta’s story comes to life in a touching and powerful way. “For me, I think the idea of being independent, being on our own, is something most every boy thinks about,” said Robinson, who plays Joe Toy, the ring leader of this trio of young men. He’s challenged by his widow father (the wonderful Nick Offerman) and older sister (actress Alison Brie), and feels like the grass could certainly be greener in another pasture. In this case, that pasture lies deep within a forest near his home where, after recruiting friend Patrick (Basso) and the eccentric and scene-stealing Biaggio (Arias, who you can see in the highly-anticipated “Ender’s Game” this fall), they build a house using mostly discarded materials. In their hideaway, they survive, they strive, and they begin to realize that leaving home doesn’t mean not missing it. “The Kings of Summer” is now playing in independent film theaters nationwide, and getting very positive reviews. With a combination of experienced and up-and-coming cast members, it’s a fun summertime escape from reality, which, for most of us, is something we probably all need at times.